It is scarcely possible to overstate the high reputation that the Swiss Post has enjoyed among the Swiss for well over a century. Its delivery of mail and packages was always impeccable – you never hear anyone complain that a letter must have been 'lost in the post'; its staff were utterly reliable – a job with the Post carried social standing and respect; its financial services were efficient and economical – the Post developed a simple payments system on which everyone relied; its PostAuto bus service in particular was a byword for reliability and rational efficiency in transporting people and post. The combination of the postal services and the PostAuto was one of the glues that bound the country with its complex and challenging terrain together. But in these days of electronic communications the Swiss postal services – like all the others around the world – are struggling. Post offices get fewer and fewer customers and are having to be closed, or downsized into village shops. This process is happening throughout Europe. Despite the clamour of those longing for the good old days of Swiss postal services, those days are going. No one can blame the Post for coming to terms with a new world-order. It's a difficult transition though: employees have extremely good pay, working conditions and pension arrangements – once in place these things cannot change overnight. And let's not forget: quality costs money. But disaster has struck in the last few weeks – a disaster that has shredded the reputation of the Swiss Post and shocked the Swiss. The disaster started with that most emblematically Swiss of postal services, the PostAuto. 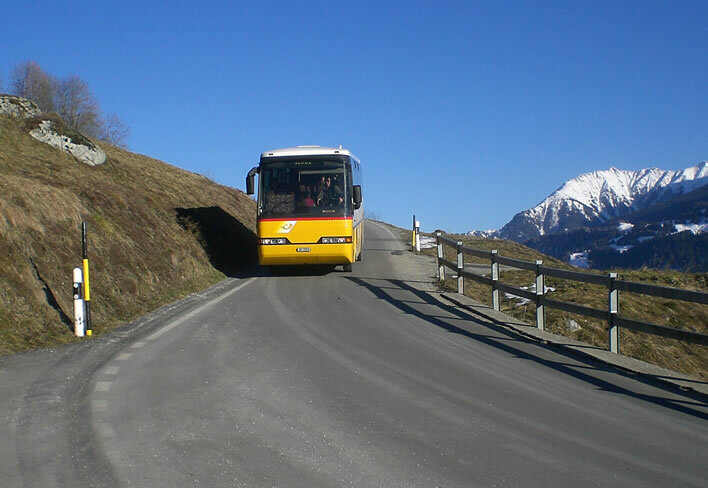 The classic PostAuto service under blue skies and white mountain-tops: extremely professional and helpful drivers and routes that connect rationally with all the other nodes of the Swiss transport network. Image: ©FoS. PostAuto services are subsidised by the taxpayer when they make a loss. Within reason such losses are acceptable as the price for maintaining the integrity of the country's communications. And PostAuto has been making losses over the years and the public purse has been making them good – although with much grinding of teeth. On local routes the PostAuto service is not supposed to make a profit – break even is the best one should hope for. Keeping life in mountain villages going: waiting for the PostAuto at a stop in Graubünden/Grisons. Image: ©FoS. Only, they haven't been making losses, they have been making profits on many of these routes, profits which they have caused to vanish with some bookkeeping tricks in order to keep the subsidies flowing. Within a month the image of PostAuto has gone from Swiss rectitude and Swiss probity to Sicilian venality. Invoices from suppliers and sub-contractors have been inflated, non-existent goods have been purchased – every possibility in the book of corrupt financial manipulation has been exhausted in order to be able to suppress profit and claim millions of Swiss francs from the taxpayer. From routes on which they are not supposed to make a profit they have been booking those profits out into categories such as 'other income' So far it is known that the deception started in 2007 at least and that the sum of money fraudulently hidden from the taxpayer by 2016 amounted to 107 million CHF, which resulted in an overpayment of subsidies of around 78 million CHF. At the moment no one has any clear idea of where this money went. 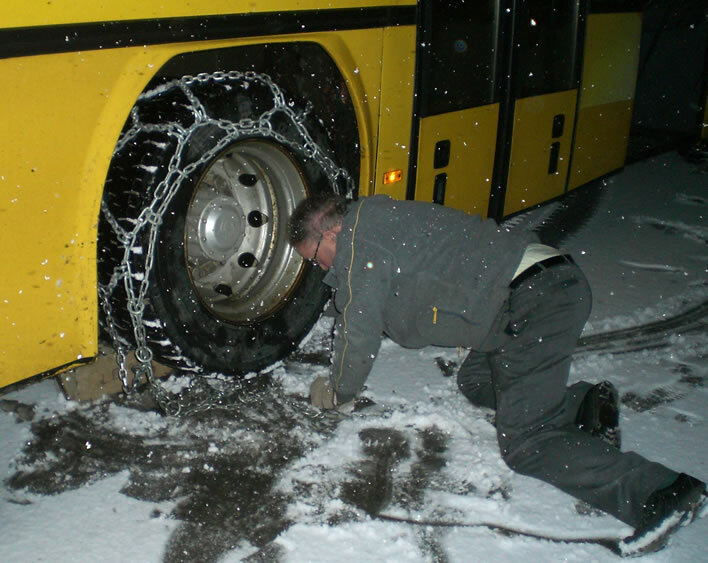 Putting the chains on with the onset of snow. PostAuto drivers are made of tough stuff: they may have to do this several times a week in changeable weather. Image: ©FoS. At the beginning of this month the CEO of PostAuto was pensioned off with immediate effect. The CFO of PostAuto has been 'released from his duties'. On Valentine's Day the Transport Ministry initiated legal proceedings. It wants its 78 million CHF back. The CEO of the Post claims not to have known that this corruption was going on, but that claim requires considerable suspension of disbelief, particularly since it is the Post which has been pressuring its daughter company PostAuto to bring in the yearly profits. Recently documents have come to light that show that the CEO of the Post has known about the manipulations at least since 2013. The whole affair stinks and the reputation of this Swiss institution is evaporating rapidly. By the time all the investigations have been completed there will be no reputation left. The affair has also come at an interesting time. In a referendum on 4 March the Swiss will vote on whether they want to keep their public broadcaster, the SRG, financed through an extremely expensive compulsory licence fee. The SRG is yet another subsidy junkie in the eyes of many. The argument for preserving the licence fee is really an argument about what the Swiss call the service public in Switzerland. Those who propagate the idea of the service public see it as the price to pay for keeping a country of four languages with a difficult terrain together with shared services. Many Swiss believe that the comfortable subsidy given to the SRG for broadcasting services is far too generous and simply encourages organizational bloat. But, of course, one of the other components of the service public is the Post and its PostAuto service, now in very serious bad odour and revealing the self-service of its management to a shocked public. The PostAuto affair has delivered an example of the subsidy junkie at work: profitable services that are deliberately run at a loss to milk the subsidy cow and a resulting organizational bloat far beyond the core business. For example, the taxpayers' money that was creamed off in subsidies for the Swiss PostAuto business seems to have been used to boost the adventure of setting up a PostAuto service in France – currently making huge losses and heading for an inevitable and expensive chop. The taxpayers of Switzerland now find themselves subsidising a French bus service. Why it needs the Swiss to run a bus service in France is a question to which we will probably never receive an adequate answer. Whatever happens in that referendum, the good old days are gone and the idea of service public with them. It came as it had to – and a good thing, too. Susanne Ruoff, the CEO of the Swiss Post, has finally resigned. She did it in the modern manner: she sat tight and drew her salary until a parliamentary commission finally made perfectly clear to everyone that which she herself must have known from the beginning: there were plenty of clues to the corrupt practices in the PostAuto subsidiary that would have made any half-wake CEO sit up and pay attention. The Chairman of the Board of Swiss Post, Urs Schwaller, is the next domino in the row. Without the slightest bit of evidence he supported Ruoff and went for the 'must-have-stability' option. Having charged Ruoff with the task of investigating herself (she found herself blameless, my goodness me! ), he has managed to get himself tainted with the whole affair.